I did everything "wrong" yesterday in preparation for this morning's race ... I drank (too) much beer; I ate a greasy cheeseburger with a side of fries; I stayed on my feet much too long during the day. Things I did "right" ... I drank beer, ate a cheeseburger, and went to bed at 9:15pm. Some things work for runners, others don't. I've found that my best races are performed after a day/night of fun, ie. beer drinking. I've usually PR'd and/or placed in my age group when I've eaten a cheeseburger the night before a race. 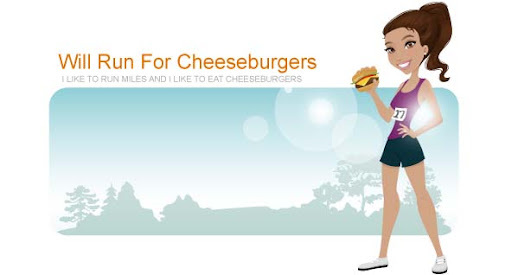 It's a scientific fact that cheeseburgers make me run faster. I swear. Oh and I didn't try anything crazy this morning ... no coffee and no weird gummy energy chews. I just stuck to a hand-full of gummy bears as my racing fuel and I think it worked. I was so close to skipping this morning's race. I woke up 1 minute before my alarm went off and I really wanted to go back to bed. My stubbornness pushed me forward and I got dressed for the (rescheduled) Charlotte 10 Miler. I am so glad that I didn't skip this race. I had been worried my knee would give me problems and that I wouldn't be able to finish. I was worried that I hadn't run enough during the days leading up to the race. I was worried that I would have stomach issues like I did during the Corporate Cup half marathon 2 weeks ago. I guess I didn't have to worry too much because today's race went exactly how you want a good race to go. I felt great the entire time ... well except for those stupid hills. Damn you Charlotte and your abundance of hills. I even had enough left in the tank for a push during the last mile where instead of pulling off to the side to puke, I raced to the finish line. Oh and unlike last year the weather was perfect. high 40's and no rain. Yahoo! Start 2 Finish put on an amazing race. They are so professional and efficient with every aspect of the race.